The following is the executive summary only. What are the smallest objects for which the search should be optimized? Should comets be included in any way in the survey? How would the expanded search be done? How long would the search take? Is there a transition size above which one catalogs all the objects, and below which the design is simply to provide warning? The Science Definition Team membership was composed of experts in the fields of asteroid and comet search, including the Principal Investigators of two major asteroid search efforts, experts in orbital dynamics, NEO population estimation, ground-based and space-based astronomical optical systems and the manager of the NASA NEO Program Office. In addition, the Department of Defense (DoD) community provided members to explore potential synergy with military technology or applications. Population estimation - An estimate of the population of near-Earth objects (NEOs), including their sizes, albedos and orbit distributions, was generated using the best methods in the current literature. We estimate a population of about 1100 near-Earth objects larger than 1 km, leading to an impact frequency of about one in half a million years. To the lower limit of an object’s atmospheric penetration (between 50 and 100 m diameter), we estimate about half a million NEOs, with an impact frequency of about one in a thousand years. Collision hazard - The damage and casualties resulting from a collision with members of the hazardous population were estimated, including direct damage from land impact, as well as the amplification of damage caused by tsunami and global effects. The capture cross-section of the Earth was then used to estimate a collision rate and thus a yearly average hazard from NEO collisions as a function of their diameter. We find that damage from smaller land impacts below the threshold for global climatic effects is peaked at sizes on the scale of the Tunguska air blast event of 1908 (50-100 m diameter). For the local damage due to ocean impacts (and the associated tsunami), the damage reaches a maximum for impacts from objects at about 200 m in diameter; smaller ones do not reach the surface at cosmic speed and energy. Search technology - Broad ranges of technology and search systems were evaluated to determine their effectiveness when used to search large areas of the sky for hazardous objects. These systems include ground-based and space-based optical and infrared systems across the currently credible range of optics and detector sizes. Telescope apertures of 1, 2, 4, and 8 meters were considered for ground-based search systems along with space-based telescopes of 0.5, 1, and 2 meter apertures. Various geographic placements of ground-based systems were studied as were space-based telescopes in low-Earth orbit (LEO) and in solar obits at the Lagrange point beyond Earth and at a point that trailed the planet Venus. Search simulation - A detailed simulation was conducted for each candidate search system, and for combinations of search systems working together, to determine the effectiveness of the various approaches in cataloging members of the hazardous object population. The simulations were accomplished by using a NEO survey simulator derived from a heritage within the DoD, which takes into account a broad range of “real-world” effects that affect the productivity of search systems, such as weather, sky brightness, zodiacal background, etc. 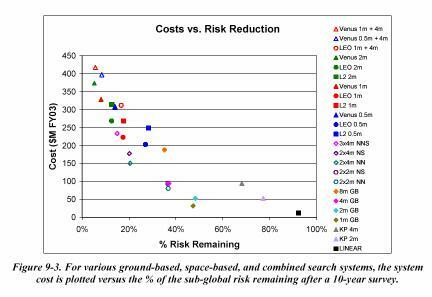 Search system cost - The cost of building and operating the search systems described herein was estimated by a cost team from SAIC. The cost team employed existing and accepted NASA models to develop the costs for space-based systems. 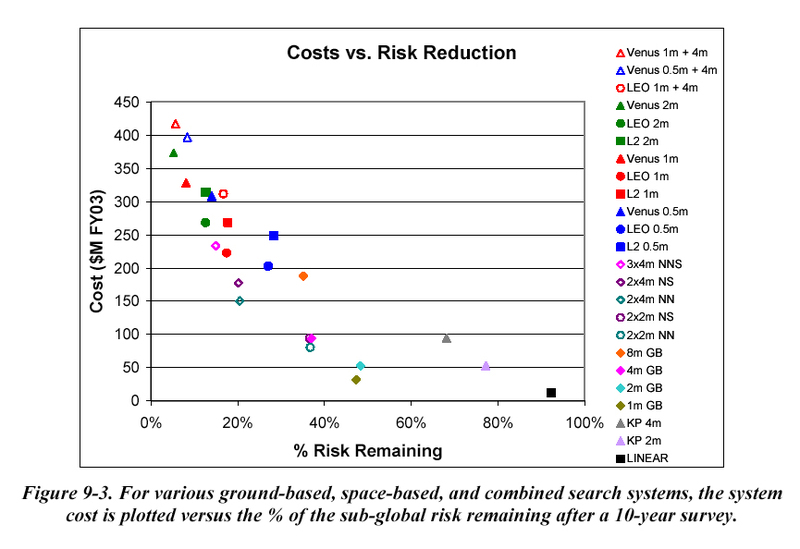 They developed the ground-based system cost estimates by analogy with existing systems. Cost/benefit analysis - The cost of constructing and operating potential survey systems was compared with the benefit of reducing the risk of an unanticipated object collision by generating a catalog of potentially hazardous objects (PHOs). PHOs, a subset of the near-Earth objects, closely approach Earth’s orbit to within 0.05 AU (7.5 million kilometers). PHO collisions capable of causing damage occur infrequently, but the threat is large enough that, when averaged over time, the anticipated yearly average of impact-produced damage is significant. Thus, while developing a catalog of all the potentially hazardous objects does not actually eliminate the hazard of impact, it does provide a clear risk reduction benefit by providing awareness of potential short- and long-term threats. The nominal yearly average remaining, or residual, risk in 2008 associated with PHO impact is estimated by the Team to be approximately 300 casualties worldwide, plus the attendant property damage and destruction. About 17% of the risk is attributed to regional damage from smaller land impacts, 53% to water impacts and the ensuing tsunamis, and 30% to the risk of global climatic disruption caused by large impacts, i.e. the risk that is expected to remain after the completion of the current Spaceguard effort in 2008. For land impacts and all impacts causing global effects, the consequences are in terms of casualties, whereas for sub-kilometer PHOs causing tsunamis, the “casualties” are a proxy for property damage. According to the cost/benefit assessment done for this report, the benefits associated with eliminating these risks justify substantial investment in PHO search systems. The Team evaluated the capability and performance of a large number of ground-based and space-based sensor systems in the context of the cost/benefit analysis. Based on this analysis, the Team recommends that the next generation search system be constructed to eliminate 90% of the risk posed by collisions with sub-kilometer diameter PHOs. Such a system would also eliminate essentially all of the global risk remaining after the Spaceguard efforts are complete in 2008. The implementation of this recommendation will result in a substantial reduction in risk to a total of less than 30 casualties per year plus attendant property damage and destruction. A number of search system approaches identified by the Team could be employed to reach this recommended goal, all of which have highly favorable cost/benefit characteristics. The final choice of sensors will depend on factors such as the time allotted to accomplish the search and the available investment (see Figures 9.3 and 9.4). What are the smallest objects for which the search should be optimized? The Team recommends that the search system be constructed to produce a catalog that is 90% complete for potentially hazardous objects (PHOs) larger than 140 meters. Should comets be included in any way in the survey? The Team’s analysis indicates that the frequency with which long-period comets (of any size) closely approach the Earth is roughly one-hundredth the frequency with which asteroids closely approach the Earth and that the fraction of the total risk represented by comets is approximately 1%. The relatively small risk fraction, combined with the difficulty of generating a catalog of comets, leads the Team to the conclusion that, at least for the next generation of NEO surveys, the limited resources available for near-Earth object searches would be better spent on finding and cataloging Earth- threatening near-Earth asteroids and short-period comets. A NEO search system would naturally provide an advance warning of at least months for most threatening long-period comets. What is technically possible? Current technology offers asteroid detection and cataloging capabilities several orders of magnitude better than the presently operating systems. NEO search performance is generally not driven by technology, but rather resources. This report outlines a variety of search system examples, spanning a factor of about 100 in search discovery rate, all of which are possible using current technology. Some of these systems, when operated over a period of 7-20 years, would generate a catalog that is 90% complete for NEOs larger than 140 meters (see Figure 9-4). How would the expanded search be done? From a cost/benefit point-of-view, there are a number of attractive options for executing an expanded search that would vastly reduce the risk posed by potentially hazardous object impacts. The Team identified a series of specific groundbased, space-based and mixed ground- and space-based systems that could accomplish the next generation search. The choice of specific systems will depend on the time allowed for the search and the resources available. What would it cost? 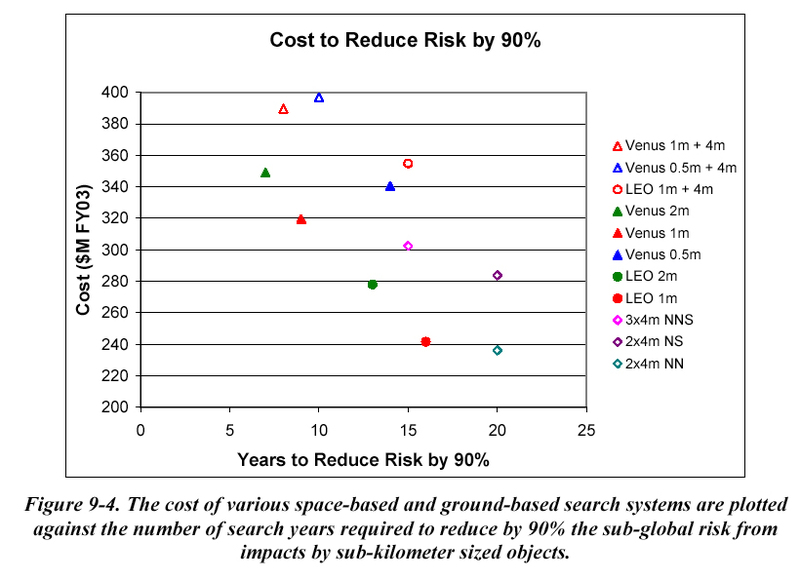 For a search period no longer than 20 years, the Team identified several systems that would eliminate, at varying rates, 90% of the risk for sub-kilometer NEOs, with costs ranging between $236 million and $397 million. All of these systems have risk reduction benefits which greatly exceed the costs of system acquisition and operation. How long would the search take? A period of 7-20 years is sufficient to generate a catalog 90% complete to 140-meter diameter, which will eliminate 90% of the risk for sub-kilometer NEOs. The specific interval depends on the choice of search technology and the investment allocated. Is there a transition size above which one catalogs all the objects, and below which the design is simply to provide warning? The Team concluded that, given sufficient time and resources, a search system could be constructed to completely catalog hazardous objects with sizes down to the limit where air blasts would be expected (about 50 meters in diameter). Below this limit, there is relatively little direct damage caused by the object. Over the 7-20 year interval (starting in 2008) during which the next generation search would be undertaken, the Team suggests that cataloging is the preferred approach down to approximately the 140-meter diameter level and that the search systems would naturally provide an impact warning of 60-90% for objects as small as those capable of producing significant air blasts. 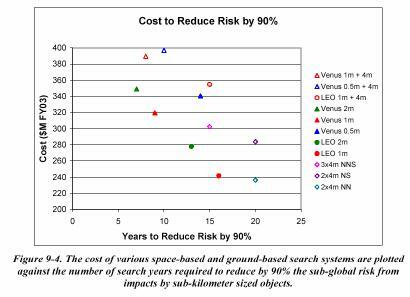 Recommendation 1 - Future goals related to searching for potential Earth-impacting objects should be stated explicitly in terms of the statistical risk eliminated (or characterized) and should be firmly based on cost/benefit analyses. This recommendation recognizes that searching for potential Earth impacting objects is of interest primarily to eliminate the statistical risk associated with the hazard of impacts. The “average” rate of destruction due to impacts is large enough to be of great concern; however, the event rate is low. Thus, a search to determine if there are potentially hazardous objects (PHOs) likely to impact the Earth within the next few hundred years is prudent. Such a search should be executed in a way that eliminates the maximum amount of statistical risk per dollar of investment. Recommendation 2 - Develop and operate a NEO search program with the goal of discovering and cataloging the potentially hazardous population sufficiently well to eliminate 90% of the risk due to sub-kilometer objects. The above goal is sufficient to reduce the average casualty rate from about 300 per year to less than 30 per year. Any such search would find essentially all of the larger objects remaining undiscovered after 2008, thus eliminating the global risk from these larger objects. Over a period of 7-20 years, there are a number of system approaches that are capable of meeting this search metric with quite good cost/benefit ratios. Recommendation 3 - Release a NASA Announcement of Opportunity (AO) to allow system implementers to recommend a specific approach to satisfy the goal stated in Recommendation 2. Based upon our analysis, the Team is convinced that there are a number of credible, current technology/system approaches that can satisfy the goal stated in Recommendation 2. The various approaches will have different characteristics with respect to the expense and time required to meet the goal. The Team relied on engineering judgment and system simulations to assess the expected capabilities of the various systems and approaches considered. While the Team considers the analysis results to be well-grounded by current operational experience, and thus, a reasonable estimate of expected performance, the Team did not conduct analysis at the detailed system design level for any of the systems considered. The next natural step in the process of considering a follow-on to the current Spaceguard program would be to issue a NASA Announcement of Opportunity (AO) as a vehicle for collecting search system estimates of cost, schedule and the most effective approaches for satisfying the recommended goal. The AO should be specific with respect to NASA’s position on the trade between cost and time to completion of the goal.